Morganella species are the clinically characterized in the tribe Proteeae . Morganella species infections are less frequent in healthy individuals. Morganella morganii (M. morganii) is Gram-negative and facultative anaerobic bacterium of the family Enterobacteriaceae. It exists as commensal within the intestinal tract of humans, mammals, and reptiles as a normal flora . Originally, it was reported to be as common cause of summer diarrhoea but later on, clinical infections associated with urinary tract, skin and soft tissue and hepatobiliary tract were reported . They are motile, non-lactose fermenting, and have the capacity for urease production and show the presence of phenylalanine deaminase. Morganella associated infections are the fifth leading cause of UTIs in nursing home patients . According to Warren et al. catheter-associated bacteriuria due to Morganella in long term care facilities has been reported . Most of the infectious cases in microbiology laboratory were associated with urine, wounds, and from a variety of body fluids or tube drainage . M. morganii bacteremia entry has involved hepatobiliary tract, as 64% cases are related to intra-abdominal infections . Morganella species show resistance against β-lactam antibiotics, usually due to the presence of chromosomally encoded β-lactamases belonging to the AmpC β-lactamase family. Most of the β-lactamase enzymes are inducible in nature only on exposure to antibiotics . Continuous use of antibiotics leads to the high-level expression of a resistant isolate of M. morganii against second or third generation’s antibiotics . Therefore, an alternative strategy is needed to alter the antimicrobial sensitivity profile against Morganella strain. Multidrug therapy and some alternate approach are required to treat the associated infections. Due to the several side effects alternate and complementary therapy approach are the best treatment strategies. Among various complementary and alternate treatment approach, biofield treatment may be one of the approach to alter the antimicrobial sensitivity. Biofield has been defined as “energy fields that purportedly surround and penetrate the human body”. Biofield treatment refers to a group of energy therapy that affects people’s health and well-being by interacting with their biofield. According to physics, “energy” defines as the capacity to do work, and overcome resistance, while “field” refers to the force which can cause action at a distance. As a basic law in physics, when electrical signals fluctuate with time, the magnetic field generates in the surroundings. After detection of biomagnetism in laboratories, many researchers hypothesized that the flow of bioelectricity in human bodies possibly the reason of biomagnetic fields. On the other hand, specific environmental frequencies are absorbed by the biomolecules, results in alterations in the movements of component parts . Biofield therapies practice involved the alteration in consciousness states in mind. These healing modalities or touch therapies were mainly used to reduce the pain, anxiety, and promote health . Healing treatment suggests the mechanism upon modulating patient-environmental energy fields, as its main treatment approach is through bioelectromagnetics and biophysical fields that form the major role in cellular structure and function of the human body . Thus, the human body emits the electromagnetic waves in the form of bio-photons and moving electrically charged particles (ions, cell, molecule, etc. ), which surround the body. Thus, human has the ability to harness the energy from the environment or universe and can transmit into any living or nonliving object(s) around the Globe. The objects always receive the energy and responding into the useful way that is called biofield energy and the process is known as biofield treatment. Mr. Trivedi’s unique biofield energy is also known as The Trivedi effect®, which has been reported to alter the structural, physical and thermal properties of several metals and ceramics in material science research [13-15], improved the overall productivity of crops [16,17], altered characteristics features of microbes [18-20] and improved growth and anatomical characteristics of medicinal plants [21,22]. Due to the significant impact of biofield treatment, and clinical importance of M. morganii, the study was designed to evaluate the impact of Mr. Trivedi’s biofield energy treatment on M. morganii in relation to study the phenotypic and genotypic characters of organism using 16S rDNA sequencing analysis. M. morganii, American Type Culture Collection (ATCC 25829) strain was procured from MicroBioLogics, Inc., USA and stored with proper storage conditions until further use. All the tested antimicrobials and biochemicals were procured from Sigma-Aldrich (MA, USA). The antimicrobial susceptibility, biochemical reactions and biotype number were estimated with the help of MicroScan Walk-Away® (Dade Behring Inc., West Sacramento, CA, USA) using Negative Breakpoint Combo 30 (NBPC 30) panel with respect to control group (Gr.). The 16S rDNA sequencing study was carried out using ultrapure genomic DNA prep kit; Cat KT 83 (Bangalore Genei, India). The turbidity standard technique using direct inoculation of revived and lyophilized M. morganii was used. Using a sterile wooden applicator stick or bacteriological loop, the surfaces of 4-5 large or 5-10 small morphologically similar cultures were touched for well-isolated colonies from an 18-24 hour non-inhibitory agar plate. Further, colonies were emulsified in 3 mL of inoculum water (autoclaved deionized water) to an equivalent of a 0.5 McFarland barium sulfate turbidity standard. 100 μL of the standardized suspension was pipetted into 25 mL of inoculum water using pluronic and inverted 8-10 times. The impact of biofield treatment on tested bacterium M. morganii was evaluated in two groups. Group I: ATCC strain in lyophilized state was considered as control. No treatment was given and analyzed for antimicrobial sensitivity, biochemical reactions and biotype number as per the standard protocol. Group II: The lyophilized state of ATCC strain was divided into two parts named as Gr. IIA and Gr. IIB. Both the groups of ATCC strain of M. morganii in lyophilized state were assigned to the Mr. Trivedi’s unique biofield treatment. Gr. IIB sample was stored in lyophilized state for 142 days at -70ºC. Gr. IIB was further sub-divided in two separate parts named as Gr. IIB - Study I and Gr. IIB - Study II. Group IIB - Study I: After 142 days, the sample was revived and tested for antimicrobial sensitivity, MIC, biochemical reactions and biotyping were performed as per the standard protocol. Group IIB - Study II: The stored strain was revived from -70ºC and the revived culture was again provided to Mr. Trivedi’s biofield treatment (re-treatment) on day 142. After biofield retreatment, the sample was sub-cultured into three separate tubes on three different days (Day 0, Day 5 and Day 10) and analyzed keeping the main treated tube aside. Each sample was analyzed after 5 days of its sub-culturing. The lyophilized sample of M. morganii was subjected to Mr. Trivedi’s biofield energy treatment (first treatment) which was analyzed on day 10 (Gr. IIA), followed by retreatment after storing for 142 days in revived state (Gr. IIB, Study II). In details, the treatment groups in sealed pack were handed over to Mr. Trivedi for biofield treatment under laboratory conditions. Mr. Trivedi provided the treatment through his energy transmission process to the treated groups without touching the samples. After first treatment, the analysis of Gr. IIA lyophilized sample was done on day 10 for antimicrobial sensitivity along with Minimum Inhibitory Concentration (MIC), biochemical reactions with biotype number and 16S rDNA analysis as per the standard protocol. While handing over these cultures to Mr. Trivedi for retreatment purposes, optimum precautions were taken to avoid contamination . Investigation of antimicrobial susceptibility of M. morganii was carried out with the help of automated instrument, MicroScan Walk-Away® using NBPC 30 panel. The panel can be stored at 2 to -25ºC for analysis. The panel was allowed to equilibrate to room temperature prior to rehydration. All opened panels were used on the same day. The tests carried out on MicroScan were miniaturized of the broth dilution susceptibility test that has been dehydrated. Briefly, 0.1 mL of the standardized suspension of M. morganii was pipetted into 25 mL of inoculum water using pluronic, inverted 8 to 10 times and inoculated, rehydrated, and then subjected to incubation for 16 hours at 35°C. Rehydration and inoculation were performed using the RENOK® system with inoculators-D (B1013-4). 25 mL of standardized inoculum suspension was poured into inoculum tray. The detailed experimental procedure and conditions were followed as per the manufacturer's instructions. The antimicrobial susceptibility pattern (S: Susceptible, R: Resistant; I: Intermediate, and IB; Inducible β-lactamases) and MIC values were determined by observing the lowest antimicrobial concentration showing inhibition of growth . Biochemical reactions of M. morganii were determined using MicroScan Walk-Away®, system with NBPC 30 panel. Preparation of NBPC 30 panel, inoculum followed by dehydration and rehydration were performed in a similar way as mentioned in antimicrobial susceptibility assay for analysis of biochemical reactions followed by biotype number. The detailed experimental procedures and conditions were followed as per the manufacturer's instructions . The biotype number of M. morganii was determined on MicroScan Walk-Away® processed panel data report with the help of biochemical reactions data . Genomic DNA was isolated from M. morganii cells (Gr. IIA, sample coded as 5A) using genomic purification kit, according to the manufacturer instructions. 16S rDNA gene (~ 1.5 kb) fragment was amplified with the help of high-fidelity Polymerase Chain Reaction (PCR) using universal primers; forward primer (5'-AGAGTTTGATCCTGGCTCAG-3') and reverse primer (3'-ACGGTCATACCTTGTTACGACTT-5') . Amplified products were subjected to gel electrophoresis in 1.0% agarose gel, stained with ethidium bromide and visualized under UV light in a gel documentation unit (BioRad Laboratories, USA). The PCR amplified fragment was purified from the agarose gel using a DNA gel extraction kit. Sequencing of amplified product was done on commercial basis from Bangalore Genei, India. The 16S rDNA sequences obtained were aligned and compared with the sequences stored in GenBank database available from National Center for Biotechnology Information (NCBI) using the algorithm BLASTn program. 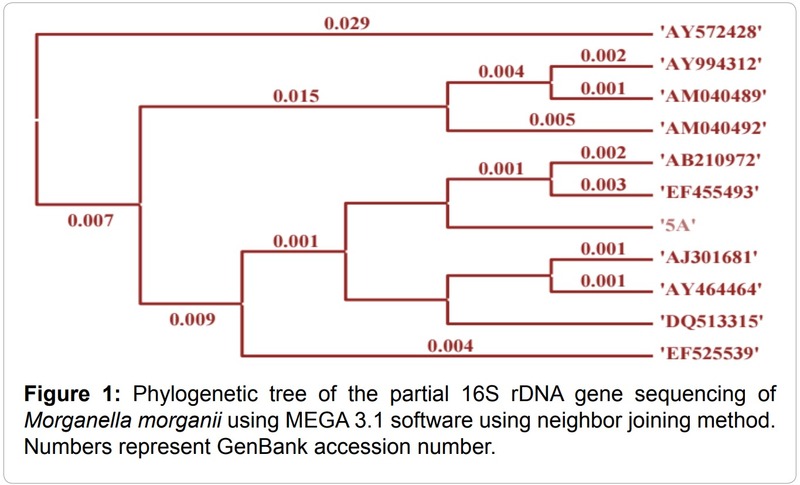 Multiple sequence alignment/phylogenetic tree were established using MEGA3.1 molecular software . R: Resistant; I: Intermediate; S: Susceptible; IB: Inducible β-lactamases; Gr: Group; Antimicrobial susceptibility pattern in control and treated groups were evaluated using automated MicroScan Walk-Away® system using NBPC30 panel. Table 1: Effect of biofield treatment on antimicrobial susceptibility pattern of Morganella morganii. compared to control (Gr. I). Piperacillin showed altered sensitivity i.e. from IB to S in Gr. IIA (day 10), Gr. IIB, study II (day 142), while it was changed to resistant (R) in Gr. 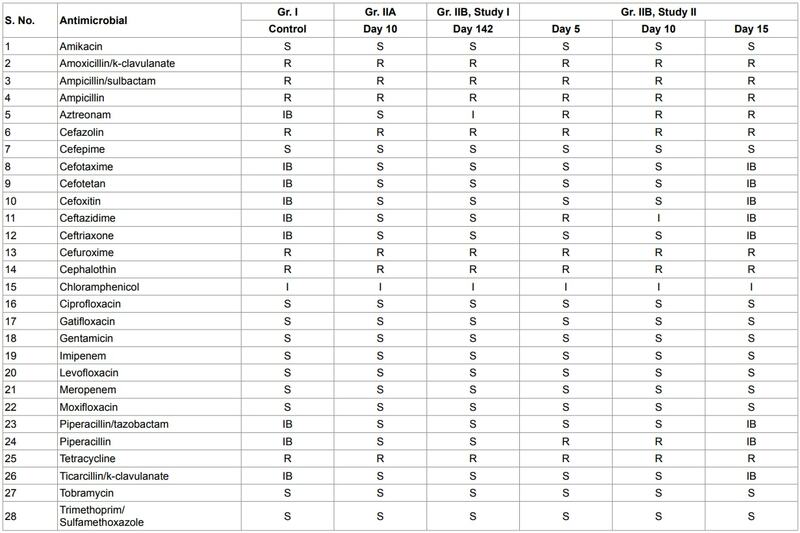 IIB, study II on day 5 and 10, as compared to control (Gr. I). Overall, biofield treatment on M. morganii showed alteration in 32.14% of tested antimicrobials out of twenty-eight results in antimicrobial sensitivity pattern with respect to control. Rest of the antimicrobials did not show any change in sensitivity pattern after biofield treatment. 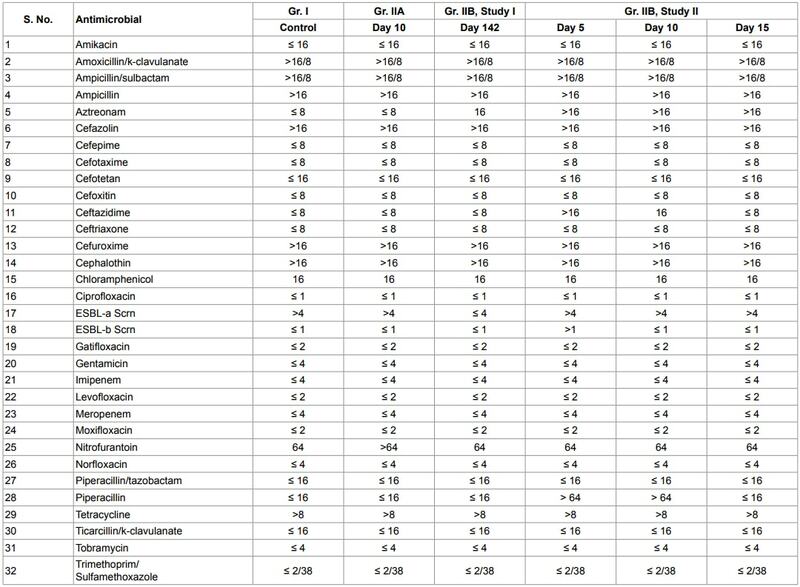 Biofield treatment on M. morganii showed altered MIC values of tested antimicrobials and results are reported in Table 2. Aztreonam showed two folds change in MIC value as (>16 µg/mL) in Gr. IIB, study II, day 5, 10, and 15, while 16 µg/mL in Gr. IIB, study I (day 142) as compared to control (≤ 8 µg/mL, Gr. I). Ceftazidime showed altered MIC, i.e., from ≤ 8 µg/mL to >16 µg/mL (Gr. IIB, study II, day 5) and 16 µg/mL (Gr. IIB, study II, day 10) as compared to control (Gr. I). ESBL-a Scrn showed decrease MIC value (≤ 4 µg/mL) in Gr. IIB, study I, day 142 after biofield treatment, while ESBL-b Scrn showed altered MIC values (>1 µg/mL) in Gr. IIB, study II, day 5 as compared to control (Gr. I). Nitrofurantoin showed altered MIC value (>64 µg/mL) in Gr. IIA, day 10, while piperacillin showed altered MIC values after re-treatment (>64 µg/mL) in Gr. IIB, study II, day 5 and 10 with respect to control (Gr. I). Overall data suggest that 18.75% alteration out of total thirty-two tested antimicrobials in MIC values after biofield treatment. Rest of the tested antimicrobials did not show any change in MIC value after biofield treatment with respect to control. MIC values are presented in µg/mL; Gr: Group; ESBL: Suspected extended-spectrum β-lactamases a, b screen; MIC values in control and treated groups were evaluated using automated MicroScan Walk-Away® system using NBPC30 panel. Table 2: Minimum Inhibitory Concentration (MIC) of Morganella morganii for tested antimicrobials. with respect to control could be due to biofield energy treatment that might alter the resistance mechanism and the effect was sustained till 142 days with respect to control. Overall, biofield treatment has impact on lyophilized as well as revived state with respect to antimicrobial sensitivity. Biochemical reactions can determine the nutritional and metabolic capabilities of a bacterial isolate, which is the most common approach for determining the genus and species of an organism. The combination of reactions are available and used to establish the enzymatic capabilities of microbes as well as the ability to grow and survive in the presence of certain inhibitors used in various biochemical reactions . 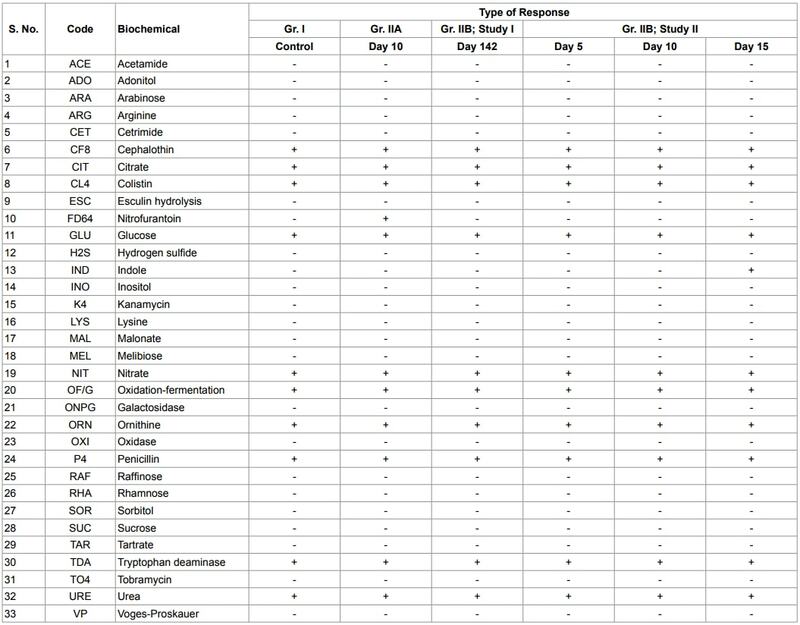 Data obtained from biochemical reactions studies for differentiation of M. morganii after biofield treatment is illustrated in Table 3. Basic characteristic of biochemical reactions of M. morganii are reported as negative reactions in adonitol, arabinose, hydrogen sulfide, malonate, melibiose, sorbitol, sucrose, and Voges-Proskauer, while positive reactions of glucose, ornithine, and urea . Experimental control results were well supported with literature data. Biofield treatment showed altered biochemical reaction of Indole (IND), i.e., negative (-) to positive (+) reaction in Gr. IIB, study II, day 15 as compared to control (Gr. I). However, nitrofurantoin (FD64) showed negative (-) to positive (+) reaction after biofield treatment in the lyophilized state in Gr. IIA, day 10 as compared to control (Gr. I). Rest of the tested biochemicals did not show any change in reaction pattern after biofield treatment (Table 3). Our group has recently reported the significant effect of biofield treatment on Burkholderia cepacia and Pseudomonas fluorescens with altered characteristic biochemical reactions [19,20]. -: negative; +: positive; Gr: Group; Biochemical reactions in control and treated groups were evaluated using automated MicroScan Walk-Away® system using NBPC30 panel. Table 3: Effect of biofield treatment on biochemical reactions of Morganella morganii. number (4005 1446) in Gr. IIB, study II (on day 15) as compared to control Gr. I (4004 1446). Alteration in species was reported in Gr. IIB, study I and Gr. IIB, study II (day 5) group with maximum probability identified as Proteus mirabilis after biofield treatment. This change of biotype number may be due to alteration of some biochemical reactions under the influence of biofield treatment. In order to confirm the PCR-based identification result, 16S rDNA sequence analysis was performed in biofield treated M. morganii strain. It includes PCR assays and DNA amplification using standard forward and reverse 16S universal primers. 16S rDNA amplification protocol has been commonly used as a taxonomic “gold standard” in the identification and determining the phylogenies of bacterial species . 16S rDNA sequence molecular analysis was used to differentiate and find the closely related microorganism of treated microbe, better identification tool than conventional method . 16S rDNA sequencing analysis can be correlated with results of biotype number based on altered biochemical reactions. considered as Operational Taxonomic Units (OTUs) in order to investigate the phylogenetic relationship of M. morganii among other ten related species (Figure 1). Total 1507 base nucleotide of 16S rDNA gene sequences were analyzed by multiple alignments using ClustalW of MEGA3.1 program. Based on the phylogenetic tree and 16S rDNA sequencing, the nearest homolog species was found to be Providencia rettgeri (Accession No: AM040492). Other closely related homologs of M. morganii can be found from the sequence alignment as shown in Table 4. Distance matrix between the 16S-rDNA sequences of 11 pathogens was analyzed based on nucleotide sequence homology using Kimura-2 Parameter. According to the data in Table 5, the lowest value of genetic distance from sample 5A was 0.003 base substitutions per site. Total 11 sequences of base substitutions per site from pairwise distance analysis were shown in Table 5. Based on nucleotides homology and phylogenetic analysis the microbe (sample 5A) was detected to be Morganella morganii (GenBank Accession Number: AB210972) with 80% identity of gene sequencing data. Biofield therapies are very popular in biomedical heath care systems as holistic medicine, which are considered significant by National Center for Complementary and Alternative Medicine (NCCAM) . NCCAM places the biofield therapy (putative energy fields) in the subcategory of energy therapies as one of the five complementary medicine domains . Biofield treatment on pathogenic microbes has been reported to alter the susceptibility pattern of antimicrobials. Data suggest that biofield energy might alter the microorganism at genetic and/or enzymatic level, which could be responsible for the change in sensitivity of antimicrobials and biochemical reactions. Based on above findings the antimicrobials those are resistance/inducible β-lactamase now converted into susceptible after biofield treatment. Antimicrobial interactions might alter at ligand-receptor level/protein level that leads to show different phenotypic characteristics . Experimental design and results suggest that alterations might occur even after storage of sample in -70ºC for 142 days. It suggests that Mr. Trivedi’s unique biofield treatment has the ability to alter the antimicrobial sensitivity in treated M. morganii even in the lyophilized storage condition for a long duration. Based on these results, it is expected that biofield treatment has the scope to be an alternative approach than the existing antimicrobial therapy in near future. AN: GenBank Accession Number; Alignment results and sequence description has been obtained from the blast results of GenBank database of National Center for Biotechnology Information (NCBI) using the algorithm BLASTn program. Table 4: The closest sequences of Morganella morganii from sequence alignment using NCBI GenBank and Ribosomal Database Project (RDP). AN: GenBank Accession Number; Nucleotide similarity is denoted above diagonal, while distance as below diagonal identities between the studied sample ‘5A’ and ten other closest homologs microbe. Total 1507 base nucleotide of 16S rDNA gene sequences were analyzed by multiple alignments using ClustalW program. Pairwise distance (lower left) and number of nucleotide difference (upper-right) for 16S forward and reverse primer was presented using Kimura-2 Parameters. Table 5: Distance matrix of biofield treated Morganella morganii based on nucleotide sequence homology (Using Kimura-2 Parameter). In conclusion, Mr. Trivedi’s biofield treatment on M. morganii showed the altered antimicrobial sensitivity of 32.14% tested antimicrobials. The MIC values of 18.75% tested antimicrobials were altered after biofield energy treatment in M. morganii. Characteristics biochemical test of M. morganii such as indole and nitrofurantoin reactions were altered followed by a change in the biotype number (4005 1446, Gr. IIB, study II) as compared to control (4004 1446). Thus, Mr. Trivedi’s unique biofield energy treatment could be applied to alter the antimicrobials resistance pattern. Molecular based 16S rDNA analysis showed that the identifiable sample in this experiment was detected as M. morganii (GenBank Accession Number: AB210972) with 80% identity of the gene sequencing data after biofield treatment. Based on the phylogenetic tree and 16S rDNA sequencing, the nearest homolog species was found as Providencia rettgeri (Accession No. AM040492). Based on these results, it seems that Mr. Trivedi’s biofield energy treatment could be used as an alternate of the existing drug therapy in future. The authors gratefully acknowledged to Trivedi science, Trivedi testimonials and Trivedi master wellness and the whole team of PD Hinduja National Hospital and MRC, Mumbai, Microbiology Lab for their support. Authors are thankful to Bangalore Genei Private Limited, for conducting the RAPD and 16S rDNA sequencing analysis. 1. Braunstein H, Tomasulo M (1978) Identification of Proteus morganii and distinction from other Proteus species. Am J Clin Pathol 70: 905-908. 2. Falagas ME, Kavvadia PK, Mantadakis E, Kofteridis DP, Bliziotis IA, et al. (2006) Morganella morganii infections in a general tertiary hospital. Infection 34: 315-321. 3. Lin TY, Chan MC, Yang YS, Lee Y, Yeh KM, et al. (2015) Clinical manifestations and prognostic factors of Morganella morganii bacteremia. Eur J Clin Microbiol Infect Dis 34: 231-236. 4. Nicolle LE, Strausbaugh LJ, Garibaldi RA (1996) Infections and antibiotic resistance in nursing homes. Clin Microbiol Rev 9: 1-17. 5. Warren JW, Tenney JH, Hoopes JM, Muncie HL, Anthony WC (1982) A prospective microbiologic study of bacteriuria in patients with chronic indwelling urethral catheters. J Infect Dis 146: 719-723. 6. McDermott C, Mylotte JM (1984) Morganella morganii: Epidemiology of bacteremic disease. Infect Control 5: 131-137. 7. Kim BN, Kim NJ, Kim MN, Kim YS, Woo JH, et al. (2003) Bacteraemia due to tribe Proteeae: A review of 132 cases during a decade (1991-2000). Scand J Infect Dis 35: 98-103. 8. Bush K, Jacoby GA, Medeiros AA (1995) A functional classification scheme for beta-lactamases and its correlation with molecular structure. Antimicrob Agents Chemother 39: 1211-1233. 9. Stock I, Wiedemann B (1998) Identification and natural antibiotic susceptibility of Morganella morganii. Diagn Microbiol Infect Dis 30: 153-165. 11. Cahil M (1998) Nurses handbook of complementary and alternative therapies. Springhouse, PA: Springhouse Corporation. 12. Schwartz GE, Simon WL, Carmona R (2007) The energy healing experiments: Science reveals our natural power to heal. (1stedn), Atria Books. 14. Trivedi MK, Patil S, Nayak G, Jana S, Latiyal O (2015) Influence of biofield treatment on physical, structural and spectral properties of boron nitride. J Material Sci Eng 4: 181. 15. Trivedi MK, Nayak G, Patil S, Tallapragada RM, Latiyal O (2015) Evaluation of biofield treatment on physical, atomic and structural characteristics of manganese (II, III) oxide. J Material Sci Eng 4: 177. 17. Lenssen AW (2013) Biofield and fungicide seed treatment influences on soybean productivity, seed quality and weed community. Agricultural Journal 83: 138-143. 23. Fader RC, Weaver E, Fossett R, Toyras M, Vanderlaan J, et al. (2013) Multi-laboratory study of the biomic automated well-reading instrument versus MicroScan WalkAway for reading MicroScan antimicrobial susceptibility and identification panels. J Clin Microbiol 51: 1548-1554. 25. Alm EW, Oerther DB, Larsen N, Stahl DA, Raskin L (1996) The oligonucleotide probe database. Appl Environ Microbiol 62: 3557-3559. 26. Williams EW, Hawkey PM, Penner JL, Senior BW, Barton LJ (1983) Serious nosocomial infection caused by Morganella morganii and Proteus mirabilis in a cardiac surgery unit. J Clin Microbiol 18: 5-9. 27. O'Hara CM, Brenner FW, Miller JM (2000) Classification, identification, and clinical significance of Proteus, Providencia, and Morganella. Clin Microbiol Rev 13: 534-546. 28. Yang YJ, Livermore DM (1988) Chromosomal beta-lactamase expression and resistance to beta-lactam antibiotics in Proteus vulgaris and Morganella morganii. Antimicrob Agents Chemother 32: 1385-1391. 29. Jacoby GA (2009) AmpC beta-lactamases. Clin Microbiol Rev 22: 161-182. 30. Barnaud G, Arlet G, Verdet C, Gaillot O, Lagrange PH, et al. (1998) Salmonella enteritidis: AmpC plasmid-mediated inducible beta-lactamase (DHA-1) with an ampR gene from Morganella morganii. Antimicrob Agents Chemother 42: 2352-2358. 31. MacFaddin JF (2000) Biochemical tests for identification of medical bacteria. (3rdedn), Lippincott Williams and Wilkins, Philadelphia, PA.
32. Woese CR (1987) Bacterial evolution. Microbiol Rev 51: 221-271. 33. Drancourt M, Bollet C, Carlioz A, Martelin R, Gayral JP, et al. (2000) 16S ribosomal DNA sequence analysis of a large collection of environmental and clinical unidentifiable bacterial isolates. J Clin Microbiol 38: 3623-3630. 34. Koithan M (2009) Introducing Complementary and Alternative Therapies. J Nurse Pract 5: 18-20. 36. Hintz KJ, Yount GL, Kadar I, Schwartz G, Hammerschlag R, et al. (2003) Bioenergy definitions and research guidelines. Altern Ther Health Med 9: A13-30.